The large disk of glass cast by the Bureau of Standards in May, 1927, has emerged into the completed paraboloidal reflector which has been placed in the Perkins Observatory telescope at Delaware, Ohio. 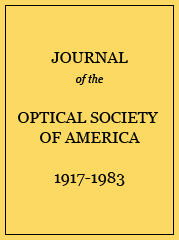 Before removal of the glass to Delaware, an extensive series of optical tests were made in the testing laboratory of the J. W. Fecker Company, in Pittsburgh, where the optical surface of the mirror was ground and figured. The final tests were carried on over a period of five days, Dr. J. S. Plaskett, director of the Dominion Astrophysical Observatory, and Dr. I. G. Gardner, of the Bureau of Standards, cooperating. Some 3000 settings were made by the knife-edge test at the center of curvature. Excellent agreement was found among the different observers. Computed results show the mean focal length of the mirror to be 24 feet 1134 inches and the departures from this value for different zones of varying radii to be not over one-tenth of a millimeter as would be tested in parallel light reflected to a focus. Tests were also made by the Hartmann method and a comparison made between the results of the two methods. The value of the Hartmann criterion for the mirror from laboratory tests is placed at 0.14. Knife-edge tests of 69-inch mirror made in Pittsburgh on November 12, 1931. Results of knife-edge test of the 69-inch mirror based on measurements made November 12 to 16, 1931. * Plates were taken and measured in Pittsburgh in November 1931, by Dr. Plaskett.